The story of Eclipse actually starts with Veil – or a Veil, at least. I’d fiddled around the NSTR enough to get a feel for some of the textures and shapes I liked, and started piecing together my first map. There’s flashes of Eclipse hidden here in the red panel and slight curve on the right wall, but the dimensions were all off and I didn’t fully understand the value of trims in this texture set. Adding the extruded boxes on the left was a nice idea for detail, but they were far too bulky and trying to tie it in with the wall the way I did was just plain ugly. Look at that bevel in the middle of the grooved section! The original Veil still showed some potential, however. That ugly lower corridor led to a space wrapped around this elevated platform I dubbed “The Overlook.” Yes, that Overlook. Eventually, this ceiling shape would inspire what would become Eclipse’s South Loop. 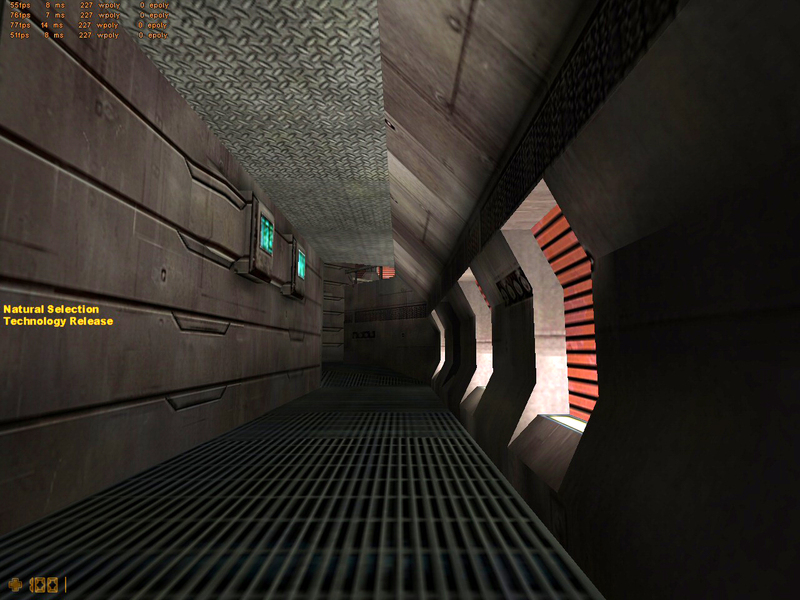 I also felt like I was on to something with this red light embedded into the wall – in hindsight, this is actually a better implementation than jamming them into the ceilings all over Eclipse and the real Veil; the grating painted into the wall texture is the perfect visual anchor. 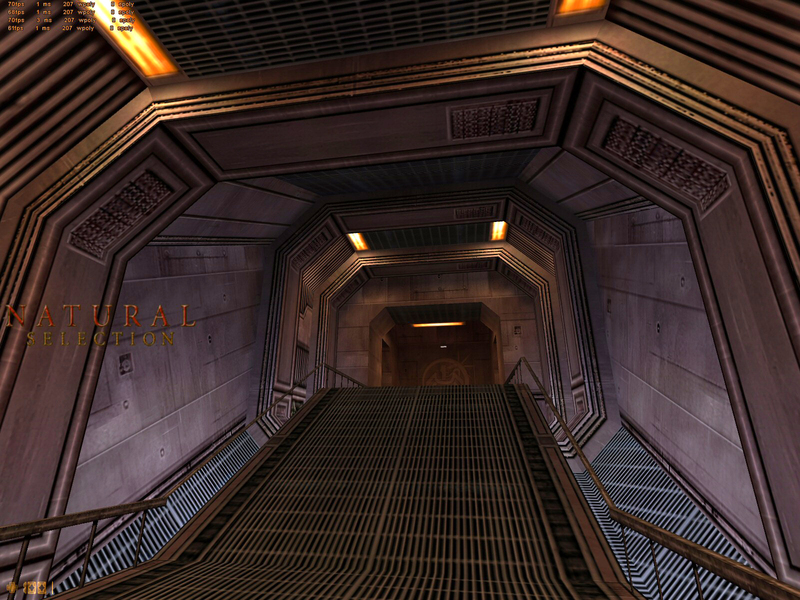 The original Veil was a very tall map, as seen around Overlook Prime and this small bridge crossing over next to a small elevator platform. While the NS mapping guidelines recommended avoiding level-over-level design, I always felt (and still believe!) 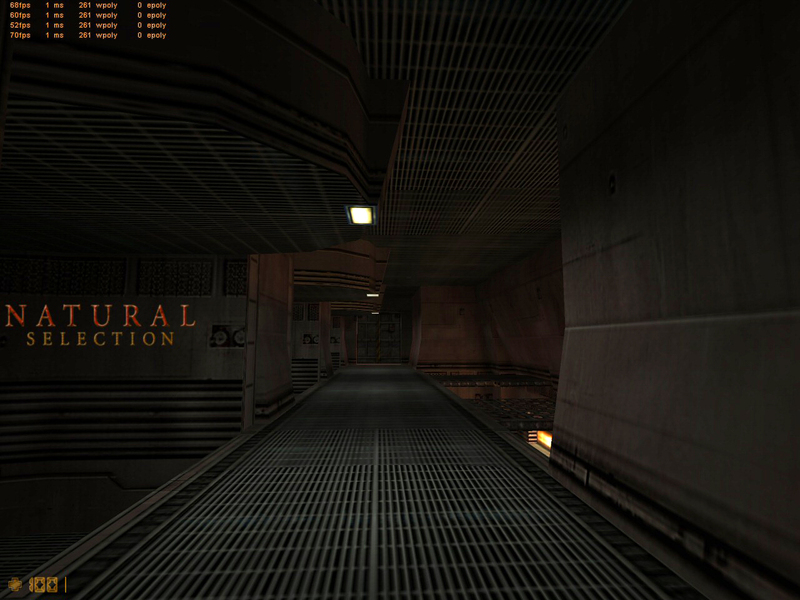 that interesting things were possible with func_seethroughs and Commander view parallax. Tangentially, before knowing how critical entity count would be to good map performance in Natural Selection, I assembled some tests using partially transparent all-black func_seethroughs to simulate thickness on ceiling and wall structures encroaching on the Commander view. I had grand dreams of showing depth and even some hidden structure between walls for Commanders, but never was able to pull it off. I apparently liked overlooks, so I put Overlook in an overlook so I could… yeah, this got a little ridiculous. Little did I know that I was actually constructing the first pass of Q4DM11‘s centerpiece platform, which I would build in late 2005. 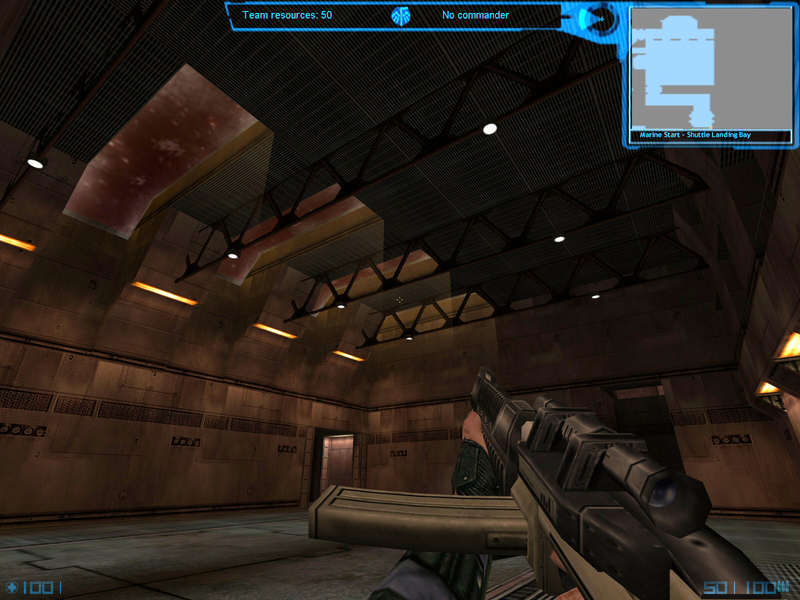 This structure is far better suited for a fast-action FFA shooter with rocket jumping than a slower-paced hybrid FPS/RTS. 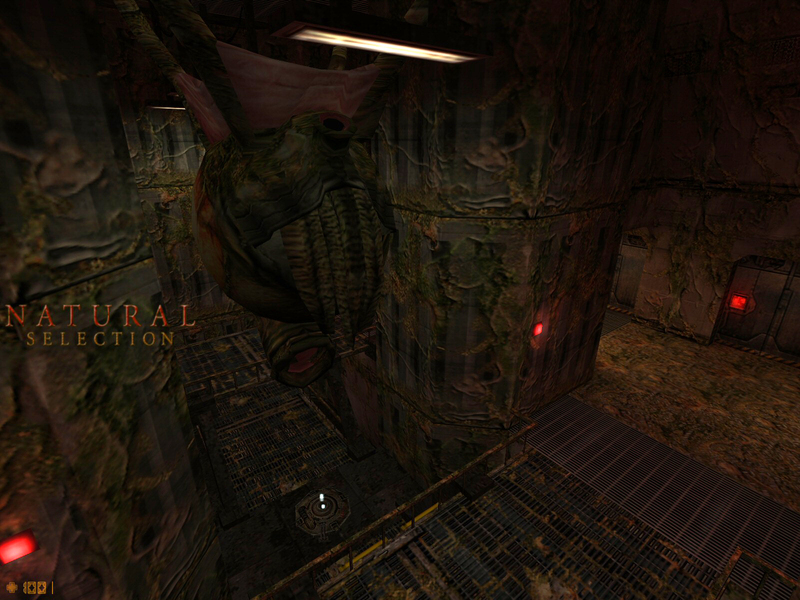 An aside about the extreme elevation in Veil – these heights were generally based on 256×256 textures. 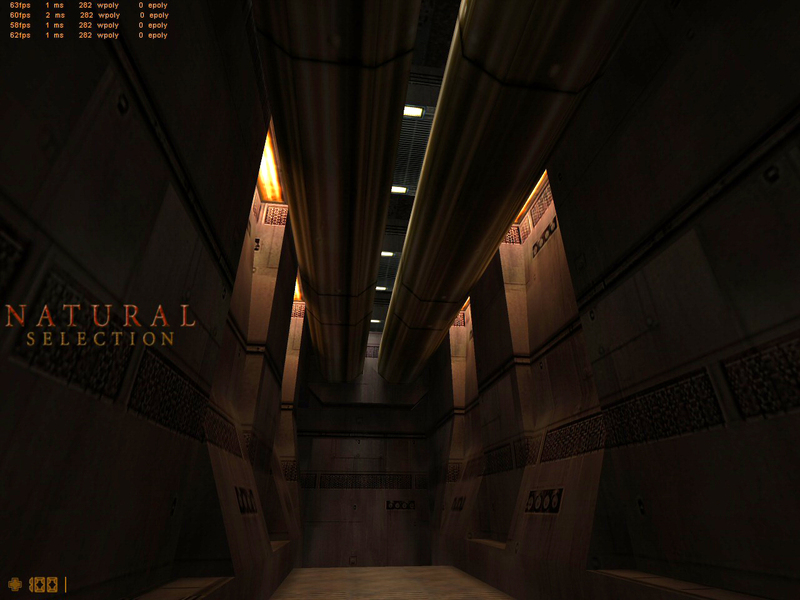 That sounds quaint now, but the Quake engine, built mostly around 64×64 and 128×128 textures at 1:1 scale, split faces at regular increments based on texture scale. This behavior pitted level designer against artist – artists authored higher-res textures, sometimes intended to be scaled down, but designers couldn’t and/or wouldn’t scale them without risking skyrocketing wpoly (short for world polygon) counts. 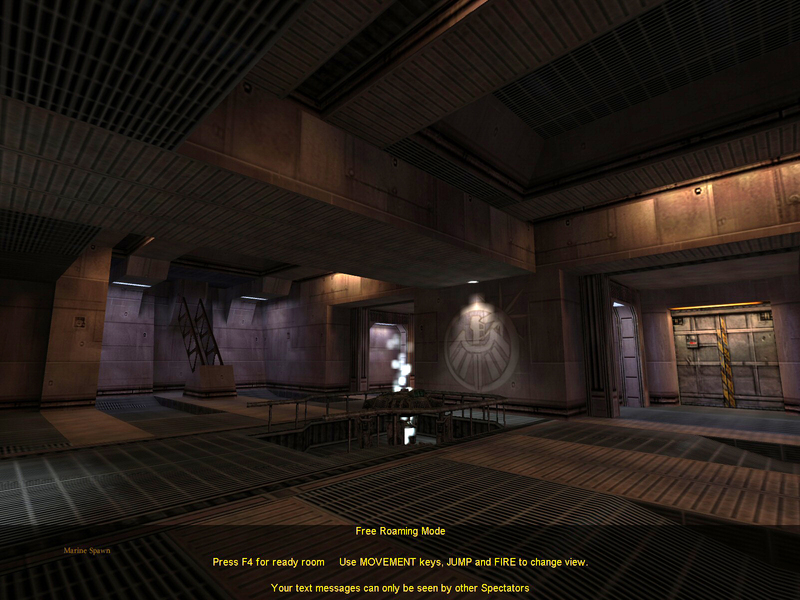 This resulted in a phenomenon where later Half-Life mods with larger textures frequently had hilariously overscaled levels – especially mods like Counter-Strike and Natural Selection which used smaller 64-unit players instead of the Half-Life standard of 72. 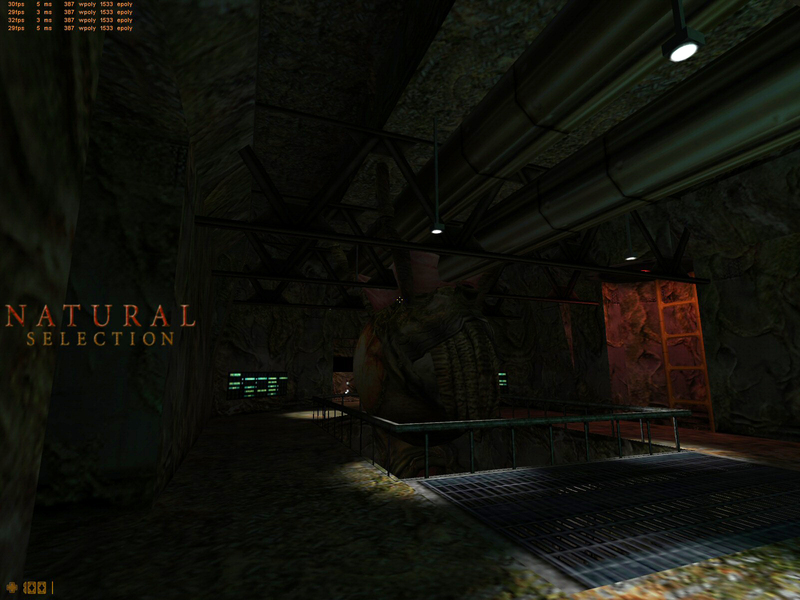 During my time building HL1 maps, I always had a certain feeling of envy towards the Quake III community and their fancy editor features, including a vague misunderstanding of what the term “shaders” meant (we were a primitive folk). 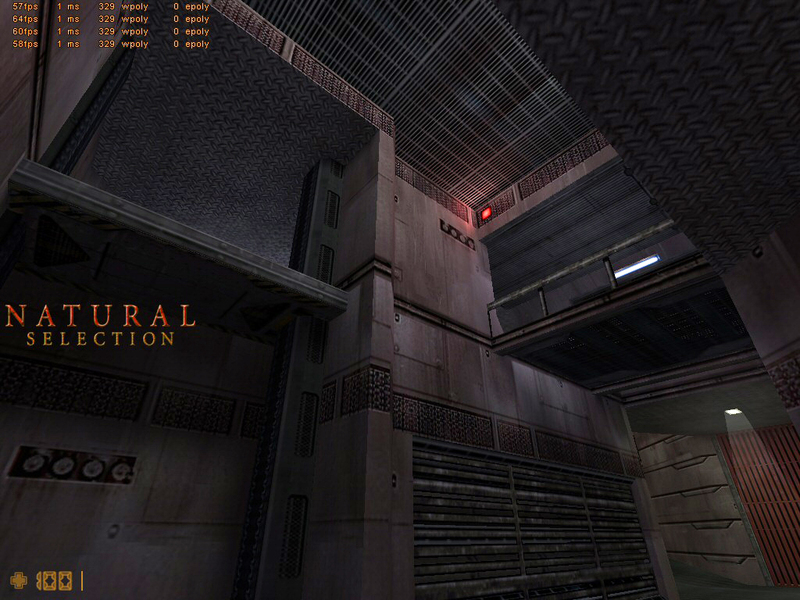 A lot of Q3 texture sets found their way into HL1 mappers’ hands, and a few of us started wondering why there were these black textures with glowy bits on them. I was among the first level designers in the HL community (alongside fellow NS contributor Kevin “Relic25” Roberts) to realize we could apply this effect to func_illusionary brushes using the additive render mode. I hacked up a couple textures from the NS .wad file to make some glowing screens, and we got Cory (Strader, NS concept/texture artist/NS2 Art Director) to author new textures with these included. 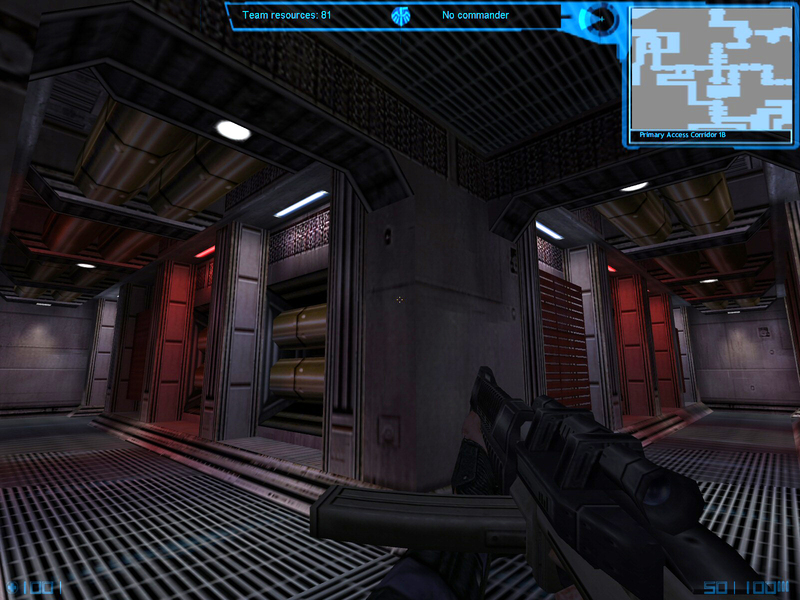 Glowy bits such as these computer screens would feature heavily in Eclipse and Veil as well as many other NS maps. I kept fiddling with the first Veil, but in the end, it never clicked. 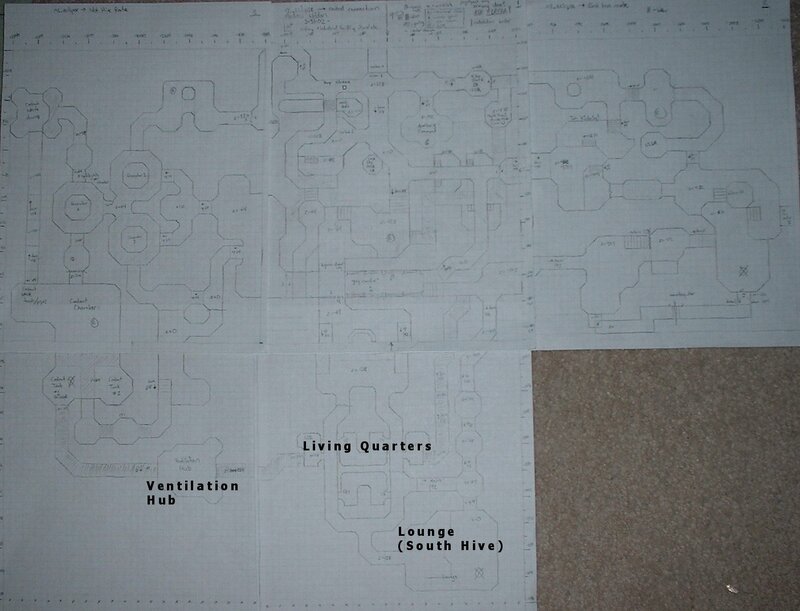 Around April 2002 I felt completely stagnant and unhappy with the jumble of a level I had mashed together. 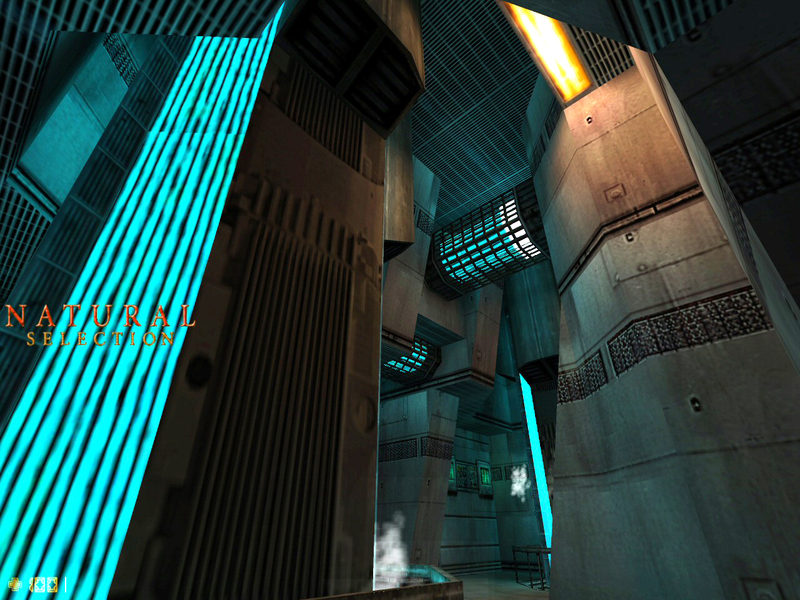 I took a break, tossing together a quick Opposing Force CTF map over a few days, and came back to a fresh idea later that month. …I have no idea what this was even supposed to be. It’s a huge step back from Veil’s first pass. I’m pretty sure those are even 16-unit tall stairs. This should have been my first clue that what works on paper doesn’t always translate as intended to 3D. I took something of a kitchen sink approach to landmarks, taking the idea of a large hangar bay for the Marine spawn from Veil, and incorporating sci-fi tropes like command centers, huge energy generators, coolant vats, and even residential areas. I may have gone overboard with the number of styles I intended to pull off, but to this layout’s credit it actually had a stronger sense of purpose and function than the final release. 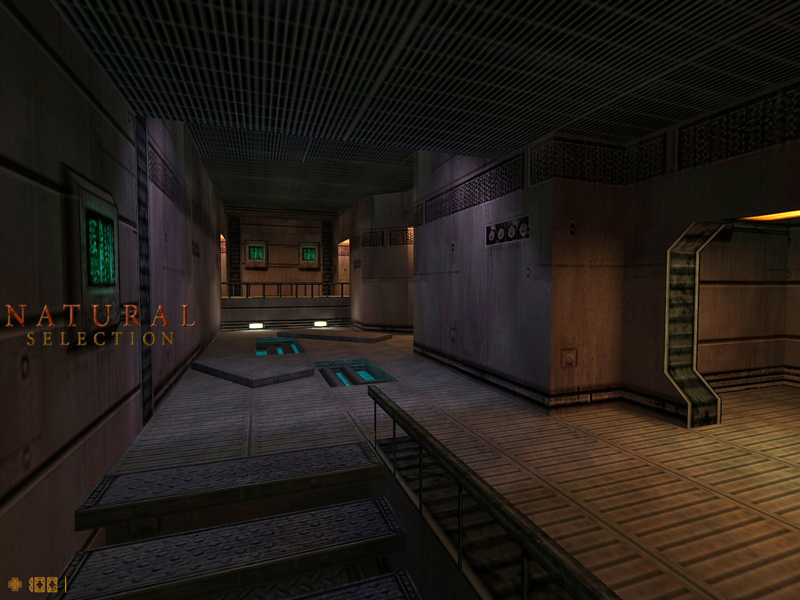 The notion of a “Glory Corridor” is such a late 90s/early 00s way of thinking about level design – naively thinking, “Hey, if I make a totally sweet detailed corridor, my map will be good!” There were far more interesting structures waiting to be built while I focused so much time and effort on this, though this corridor would still become an important anchor of Eclipse’s layout and visual style. 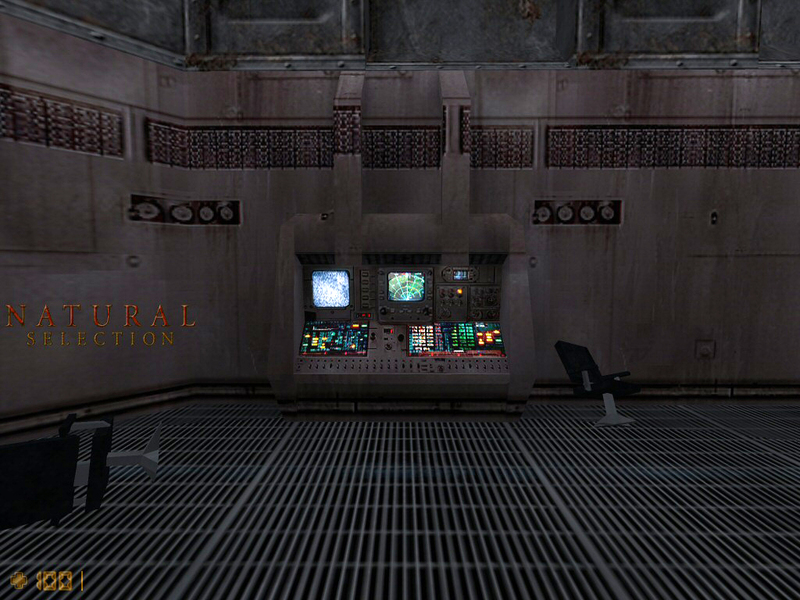 It was actually a neat thematic idea and putting coolant reserves near the big generator room served the stronger sense of place, but I was never thrilled with the rendering on the glass or caustic texture. 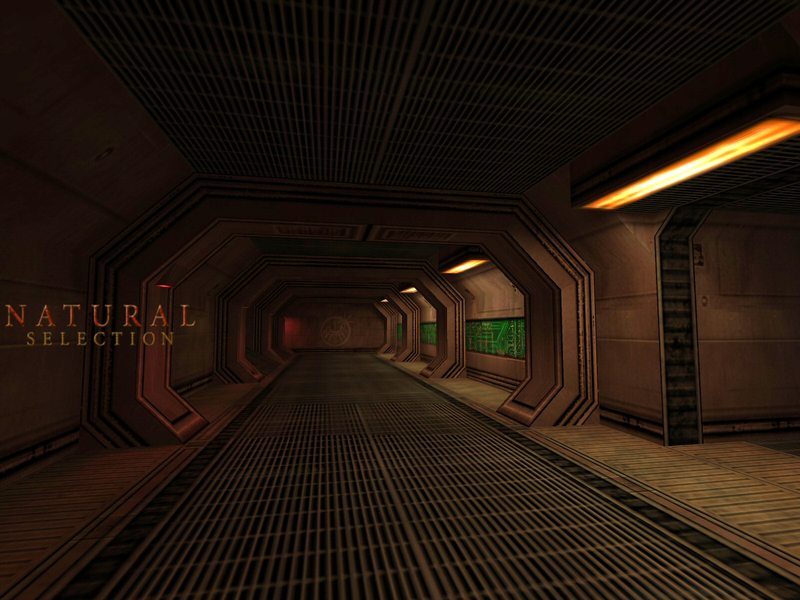 This theme is much better suited to something like NS2’s upcoming “Biodome” environment. 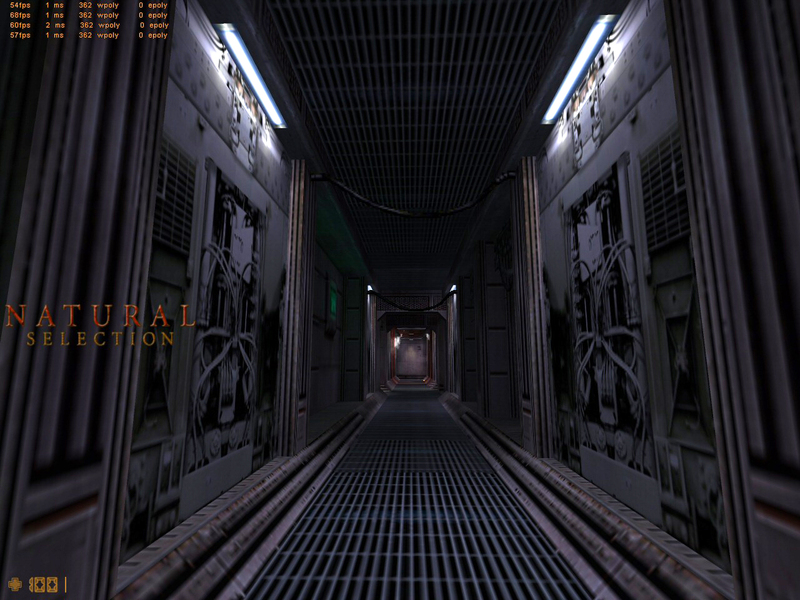 A nasty side effect of using lights.rad texture illumination was the light texture rendering fullbright, often resulting in an ugly bright square in the middle of darker geometry. 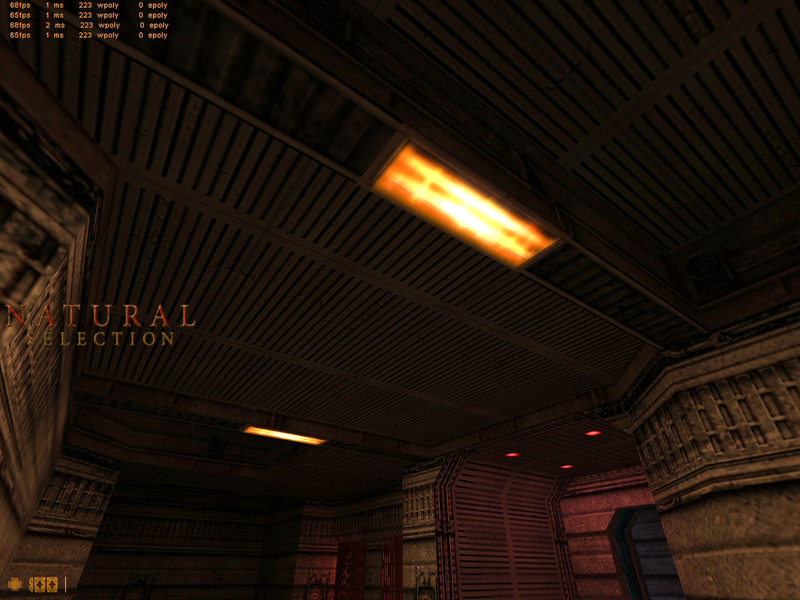 Instead of using the base light texture, I applied the texture lighting to the additive func_illusionary overlay texture, creating a much more pleasant light fixture. This light ended up playing a pretty significant role in the weeks to come. Triad came next. To give the room a bit more character I also added the blue texture to my lights.rad file, flooding the room with a nice glow around each generator. When the wall_lab love spread to the “Glory Corridor,” I didn’t have a good solution to replace the excellent but now out of theme wall_black pillars lining the hallway. In the absence of wall_lab pillars, I cracked open Paint Shop Pro and made my first textures ever: two hacked-together vertical pillars that would become a mainstay of most wall_lab-themed levels. 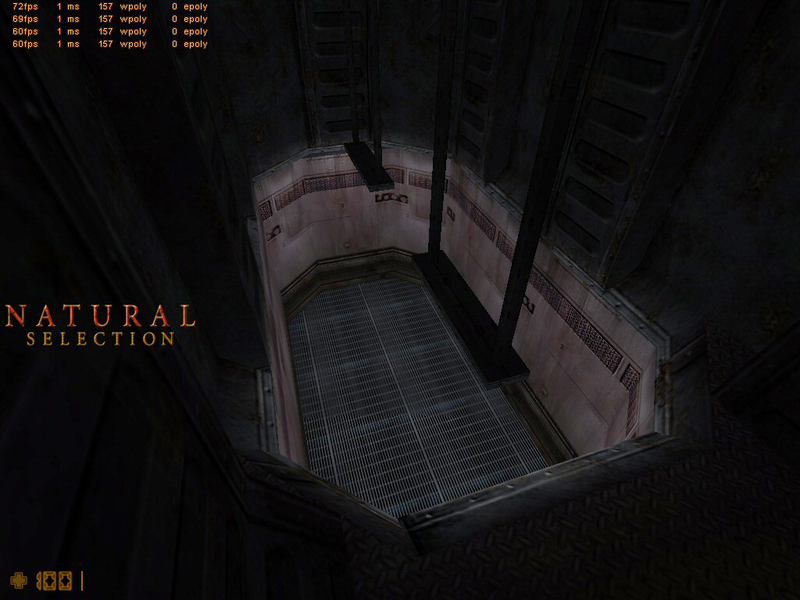 I’ll also take this opportunity to note that the “Natural Selection” watermark embedded in the NSTR (as well as the NSTR itself) may be one of the most brilliant mod marketing campaigns ever conceived. 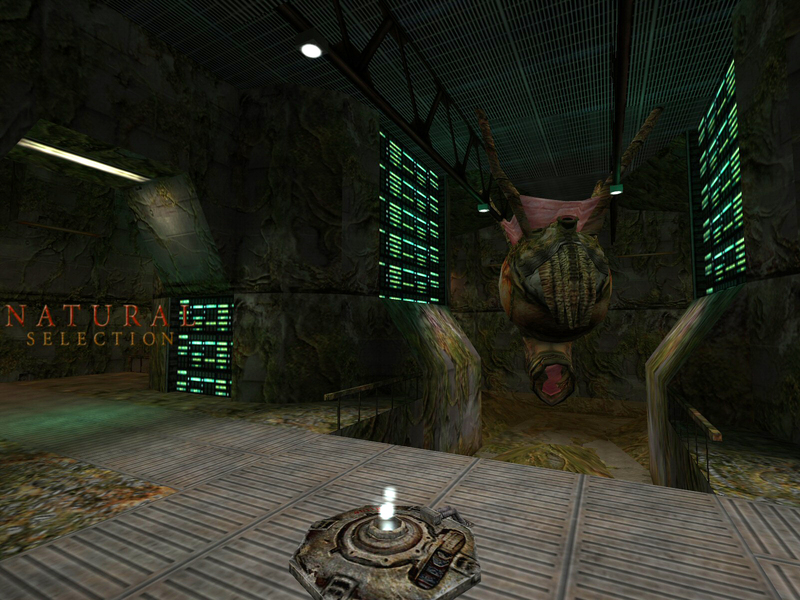 By letting people dabble with the textures and style as the mod was developing and then plastering the NS logo onto every single screenshot, Charlie managed to draw some of the Half-Life community’s best level design talent (and discovered some rising stars) while ensuring a strong selection of maps in the initial public release. I can’t speak to my exact inspiration in creating it, but I suspect I was probably influenced by an early version of ns_hera and the “Level 3” alien that would become the Lerk. 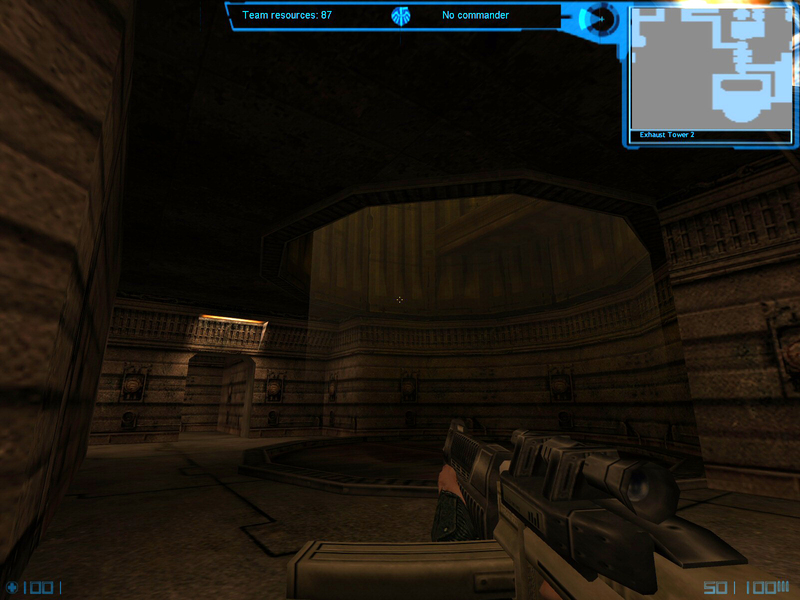 Early Hera contained a blockout room with towering ceilings that served as a perfect home for Lerk strafing runs, something I had hoped to incorporate into my layout. This area would not survive later restructuring, but would somewhat inform the ramped areas that would become Station Access East. 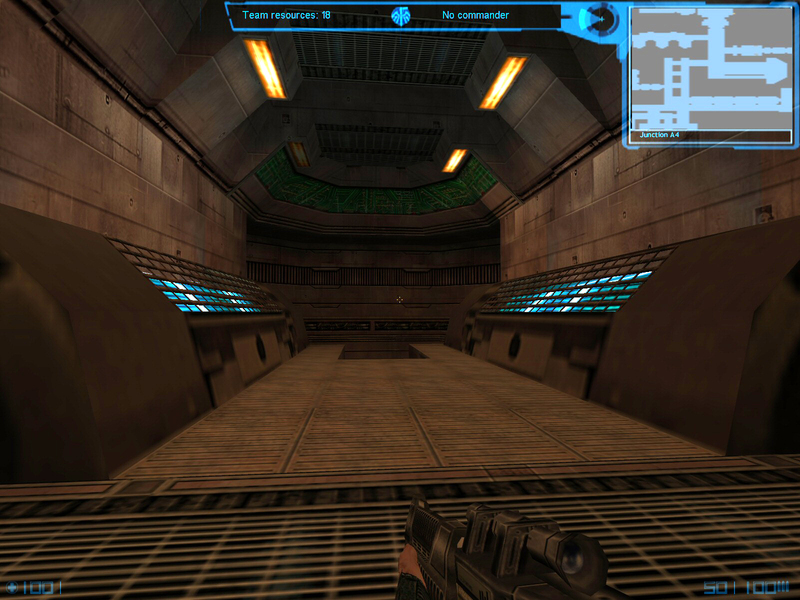 This area actually had some interesting structure and gameplay potential, offering interesting elevation (including a sunken drop-off to the right) and solid cover, but it was far too large and repetitive. If I were to build this now, I probably would use two alcoves instead of three and add a small bend to block the huge sight line down the middle. In this draft, I opened the ceiling for the first time and liked what I saw in the skylights, but it didn’t fix the problem of making the room big, bland, and ugly. This is the danger of getting too attached to an idea vs. being aware of its execution. 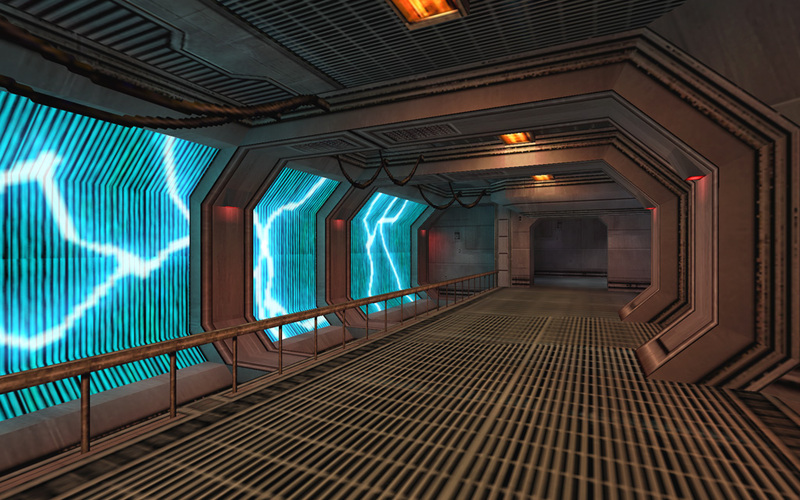 A version of this bulky door frame would become a very familiar sight throughout Eclipse (mostly around the central Access Corridors) and the new Veil. 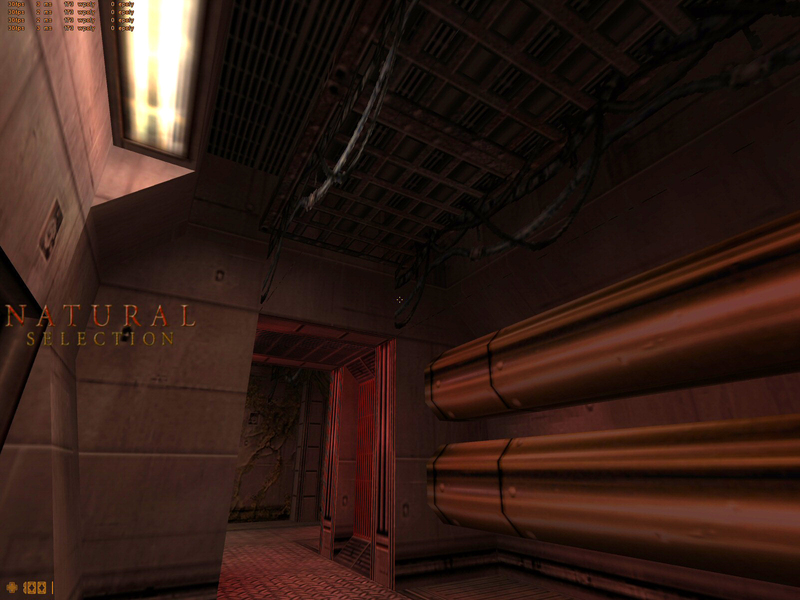 The twin gold pipes also laid the foundation for their use in the subtly named “Pipeline” area of Veil. Earlier I spoke about the dilemma of texture scale that caused problems for world scale. 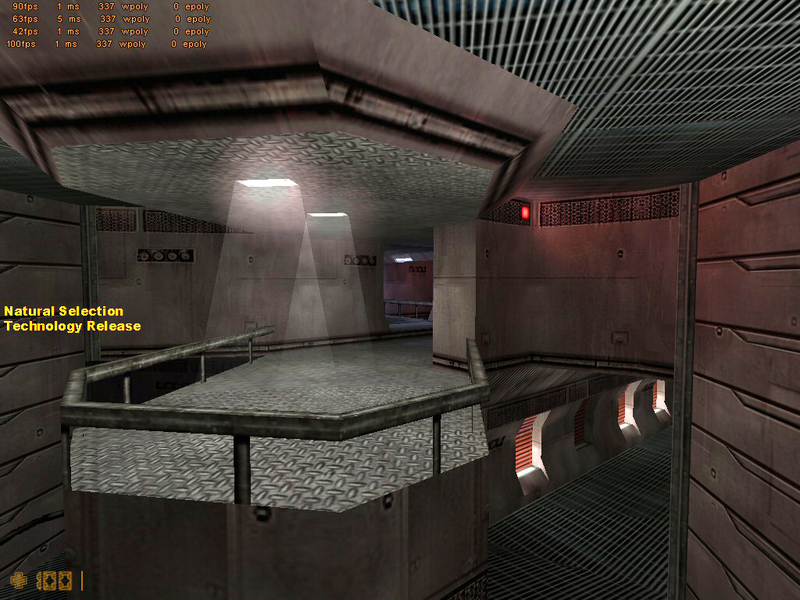 As luck would have it, I didn’t particularly care for the top 64 pixels on one of the base wall_lab textures. I also found very quickly (even as far back as the original Veil) that lopping off those 64 pixels resulted in a perfect 32 unit trim at the top of the wall. 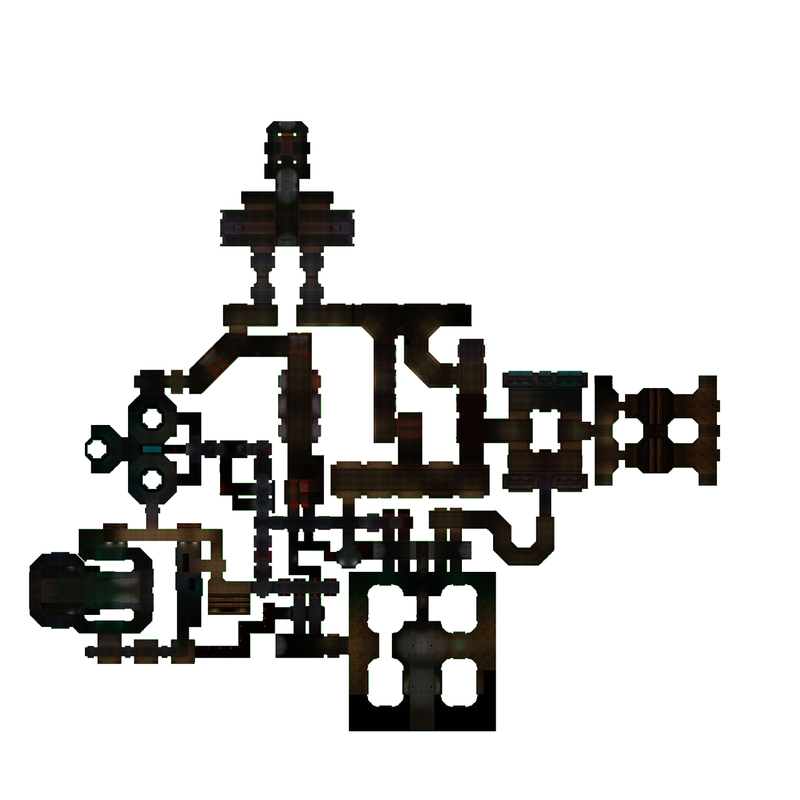 This led me to build many of my corridors at a base height of 192 instead of 256, which in turn led to many bulkheads at 160 units and many doorways down to 128. While still slightly overscaled against the player model, this helped keep the level’s proportions from getting away from me. I ended up building two versions of this room. Pictured here is the normal version with a half-open bay door, using the same fake light beam effect I had been using in the Marine spawn skylights. 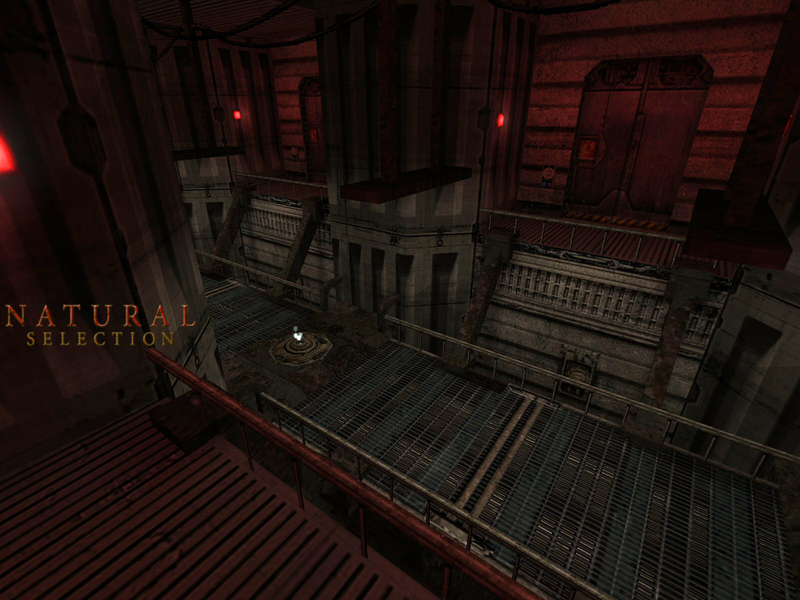 Through the door on the far side lay version 2, an infested Hive room. People were enjoying the map well enough in testing, but this was not a good map. 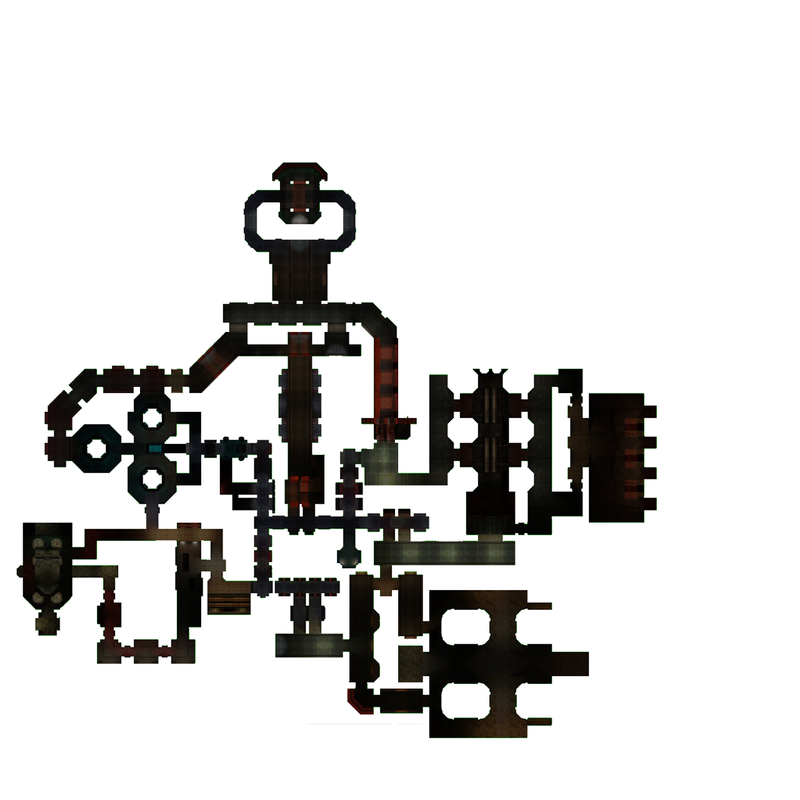 Only a few of my ideas were working the way I wanted them to and even with the more consistent wall_lab theme, the map still felt like a jumbled mess. There were too many tiny winding corridors and too many parallel or unnecessary routes. Multiple key routes required unnatural hairpin turns. The map was unnecessarily huge, too, bumping against the edge of the Hammer grid. This entire RT room had interesting ideas and structure, but was ridiculously overscaled (it’s almost as big as that hangar bay at the Marine spawn!) and a complete dead end. Why would I ever want to come here? I’ve hinted at a few different choices I made being “critical” to the development of the map, but none moreso than the decision I made after this playtest. I took a bulldozer to the entire layout, finally and decisively throwing out any notion of “oh this was in my sketch so I have to keep it” (though much of it was already long gone). 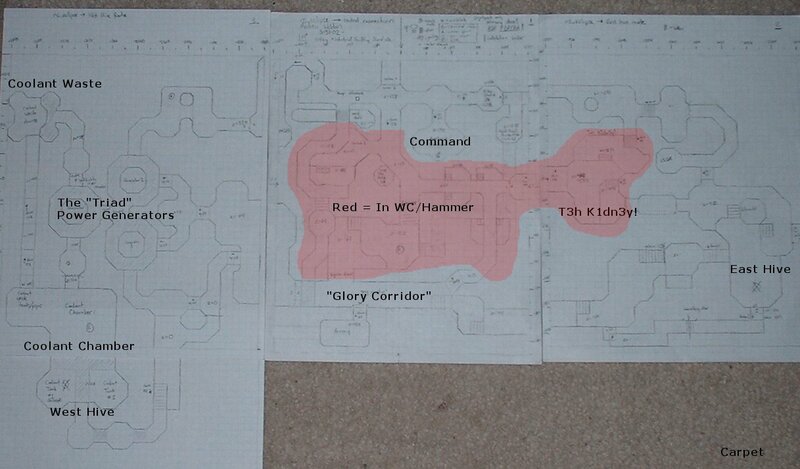 No area was off-limits – I estimated I ripped out between 70-80% of the map and rebuilt from scratch. This is the first time Eclipse looked like Eclipse. And in lieu of the massive hangar bay for the Marine Spawn, I shrunk things down and constructed this entrance structure, tucking the Command Station away in a smaller room behind. Look familiar? One slight problem is that these two entrances still required you to loop around the single linear entrance. 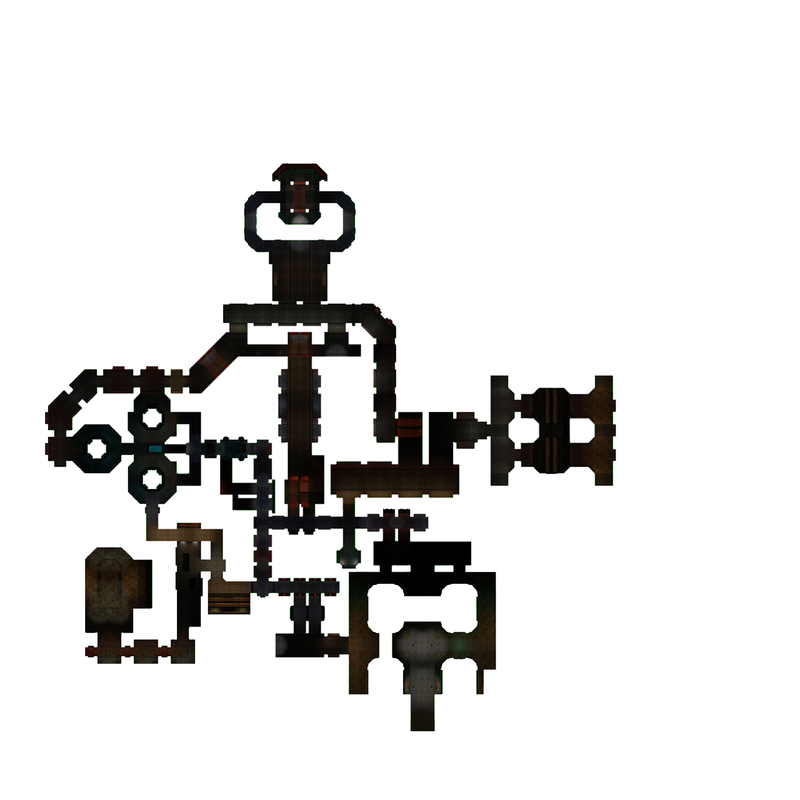 All three Hive rooms suffered the same fate in this version – every one of them was reduced to a single narrow choke point entrance. Oops. Back near the middle of the map, I replaced an extraneous Access Corridor with a bigger and bulkier route connecting the central network of corridors, Maintenance, and what would eventually become Station Access East and T Junction – my area names really were something, weren’t they? The central Access Corridors also began to shine this build – they were now the way to move between resource nodes in the heart of the map. I also added new double door frame structures near Station Access Alpha and the Computer Core entrances. These were interesting in that they took a claustrophobic and completely linear structure and created just enough space to take cover or flank an enemy in a close-range battle. Promoting Maintenance into a full Hive room was absolutely the right choice, but massively imbalanced the layout by giving the Alien team two Hives right next to each other. I pushed the Hive back to the east, adding a new room called the “Keyhole” to bridge the gap. 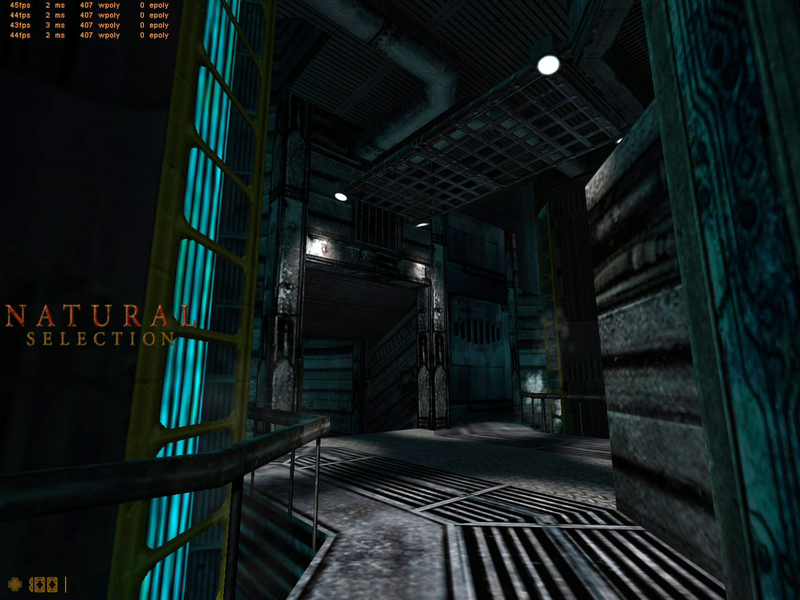 For the other side of the Keyhole, I brought in the blue texture from the Triad generators and re-applied the scrolling electric arcs I had borrowed from ns_hera in an earlier version. 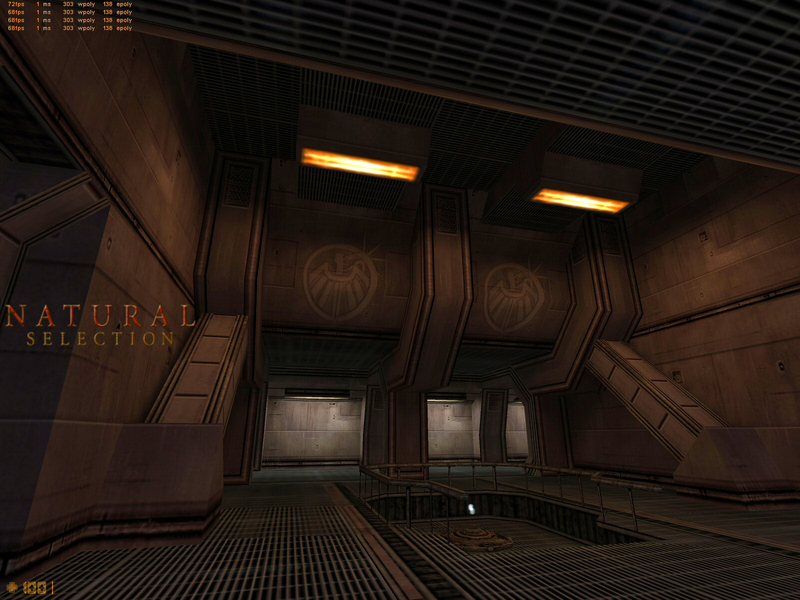 This became a landmark wall structure on this side of the map, as well as a signature image of Eclipse. By adding this space, the travel time from Computer Core to Maintenance began to even out with the time from Command to Computer Core. 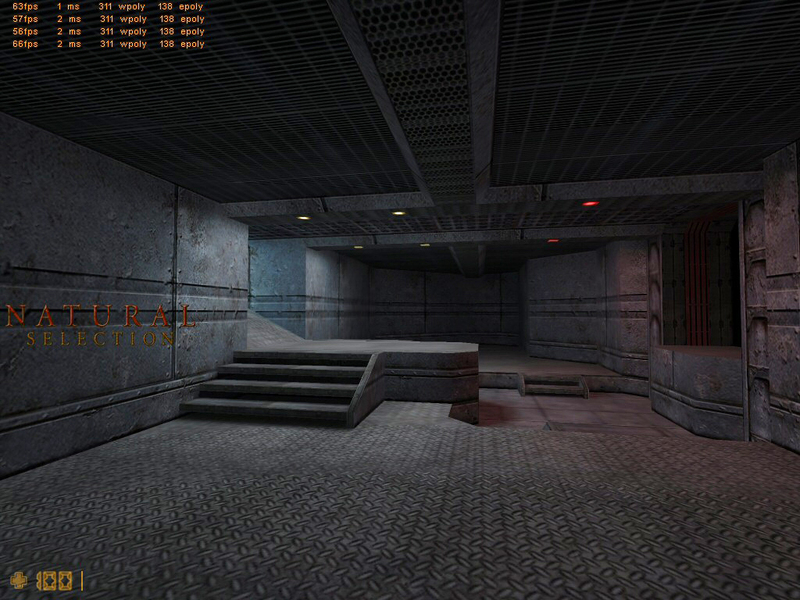 This was a key design consideration for NS map balance, and would play a significant role in Eclipse’s success. Of note: I never had a stopwatch handy and was always annoyed having to try and time my routes using the Windows clock, so instead I eyeballed routes based on Hammer grid views. By increasing my grid size to 128 or 256, I could quickly count the number of blocks from one location to the next and determine if I needed to make adjustments without compiling. It worked! This room offered a bit more space to build and a smaller, more accessible Command Chair. 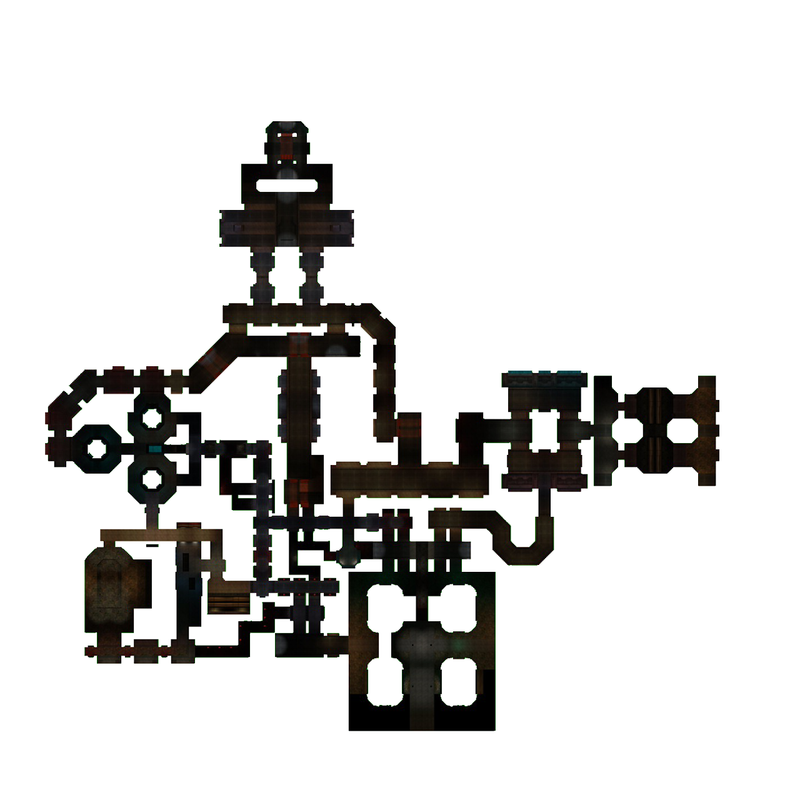 It worked for launch, but this room’s stay in the map was short lived – for NS 2.0, I ripped this out and sent both the original Marine spawn and this iteration to the new Veil as Nanogrid and the Cargo Hive, respectively. 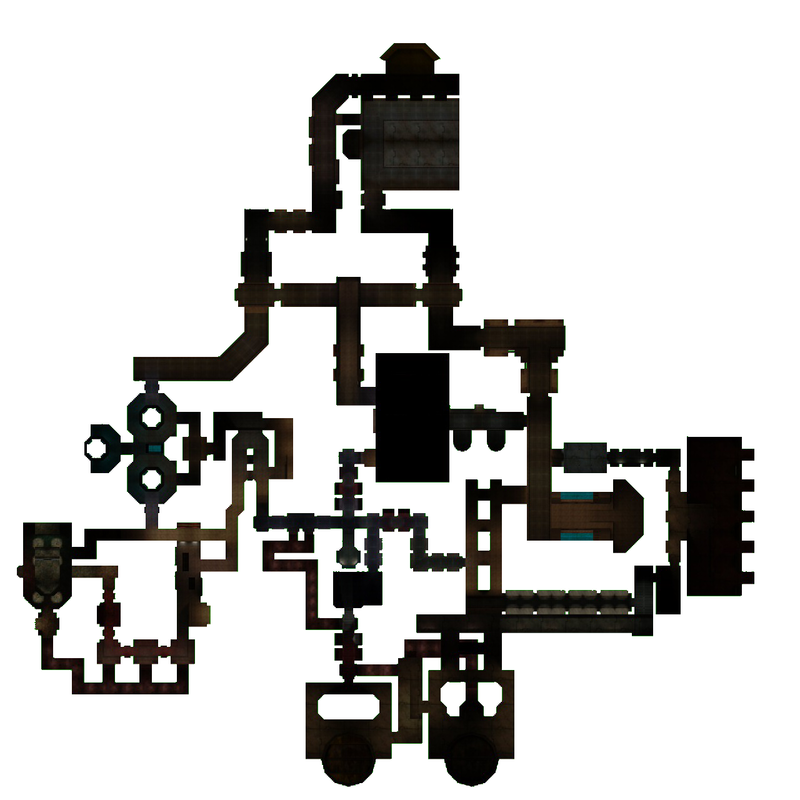 With additional playtesting and tuning, I updated the map with this layout in September. 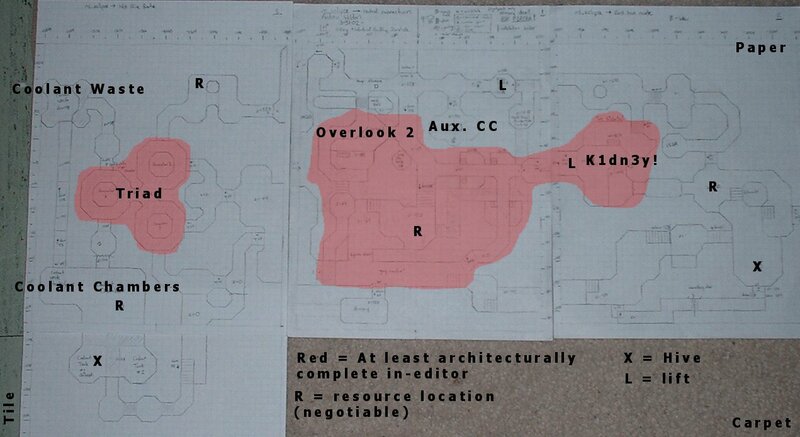 I wouldn’t fully appreciate the term “committment” in level design terms until a few months into my time working at Raven, but had started to apply it here. Note the significant split between the two routes out of Marine spawn – in the previous build, teams could get a couple steps outside and then just switch directions. Now, leaving Marine spawn meant if you wanted to go back the other way, you’d either have to backtrack or push forward through the central Access Corridors (I would end up using a similar layout strategy in the Marine spawn exits in Veil). 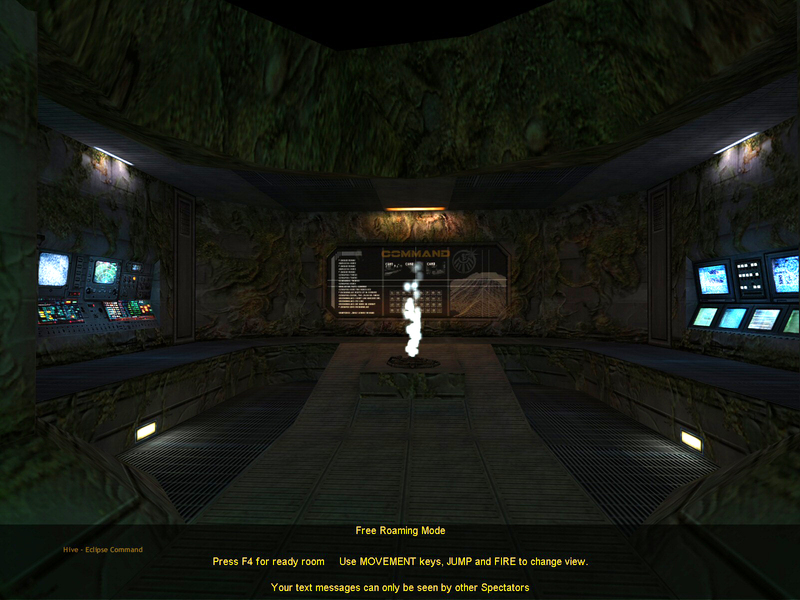 While not as drastic, similar choices were required on approach to Computer Core and the new Command Hive. While I typically abhor a hairpin turn in level design, I was also proud of what I felt was a crafty way to handle infesting the layout. On approach from Command Access North (on the way from Triad), I inserted a small null-textured (our equivalent of “nodraw” or “caulk,” depending on your more modern tool of choice) vis blocking wall covered in infestation on either side. This allowed me to retain Command’s symmetry, while allowing the infestation itself to block a route and change the layout. I wish I had done more of this – the idea of infestation is more interesting when it’s creating its own structure and flow that doesn’t necessarily line up with the base level geometry. I made a few more tweaks in the final weeks, including re-works of the approach to Maintenance (creating a split entrance on either end of the Keyhole, matching the pair of entrances to the other Hives) and the Ready Room (which, to save time, became a non-infested version of Computer Core). 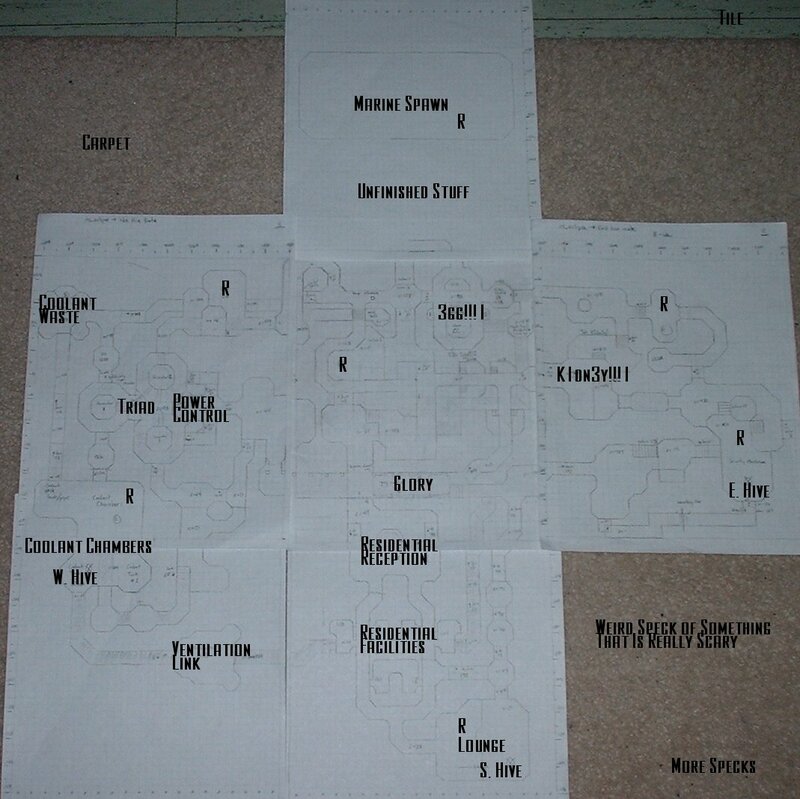 The map was a hit in playtesting, and Charlie selected it as one of the seven maps that would be included at release. Eclipse was never really a finished product; I kept tinkering with the layout well after release and alongside development of the new Veil. 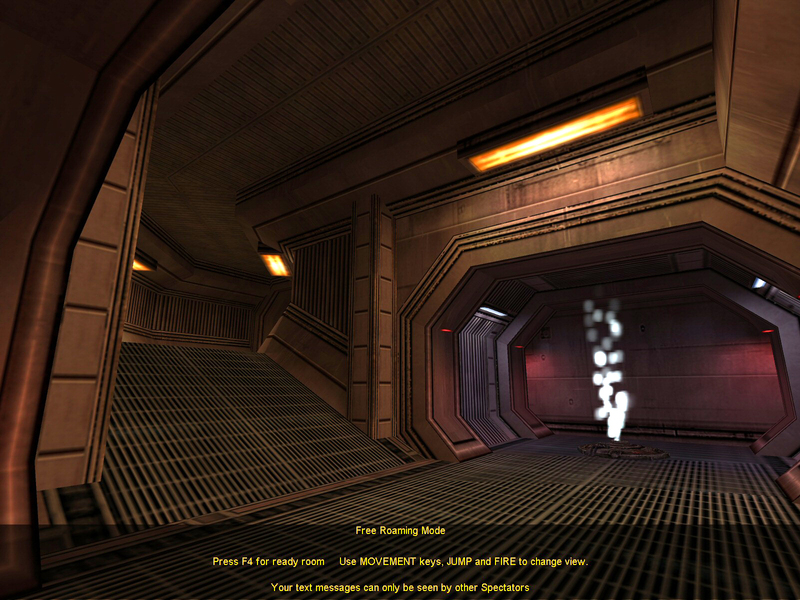 As noted previously, two old versions of Eclipse’s Marine spawn found new life as Nanogrid and Cargo in Veil. Maintenance Hive is the Spinal Tap drummer of Hive rooms, and probably would have kept getting rebuilt in every new release had I not started at Raven and passed the map off to Ben Ives in the summer of 2004. Multiple other post-release experiments also fell to the cutting room floor – poke through the old source files if you want to see some of what might have been. Elements of or nods to Eclipse have snuck their way into later work I’ve done. 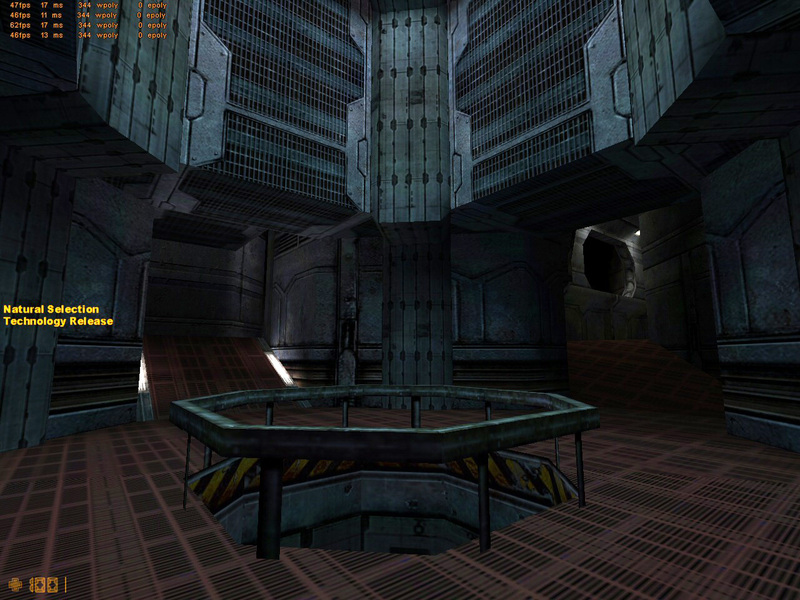 As I learned Radiant for my Quake 4 work I fiddled with a vision of what Keyhole might look like in Doom III. 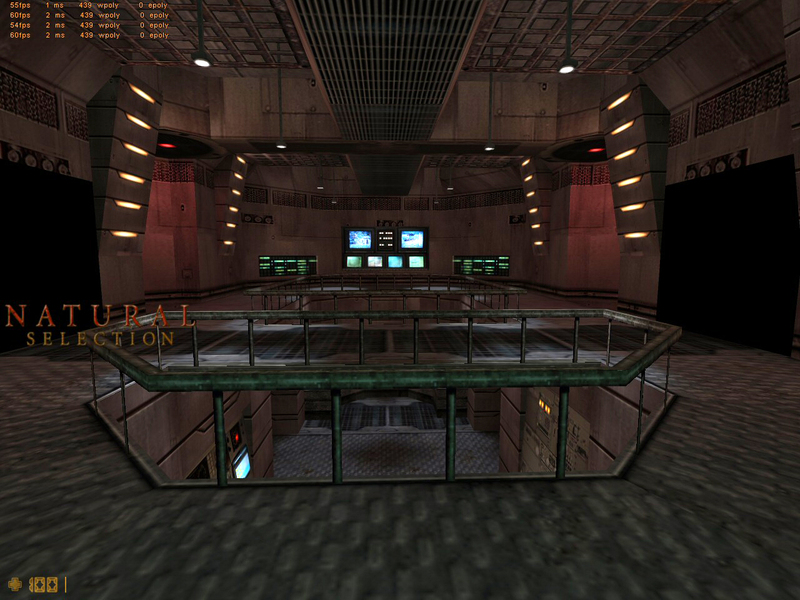 I also directly emulated the Eclipse door frames in the lower sections of Q4DM11, and the Beacon Station in the Starhawk mission “Harvest Season” is named “Eclipse Station” as a nod back to my roots on NS1. 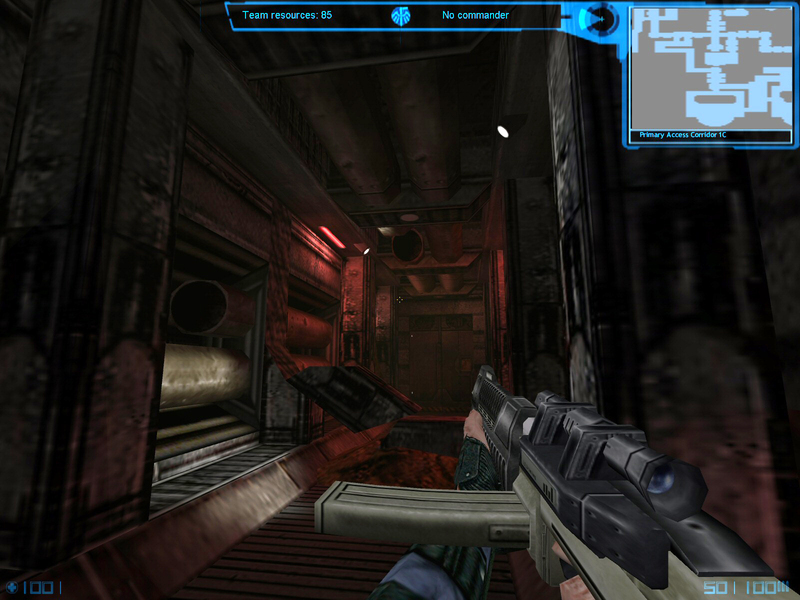 While I may still have found a career in games without making Eclipse, it certainly wouldn’t have been the one I have. Branching out from my DM/CTF comfort zone and being around the talent that made NS taught me more about multiplayer level design than anything else in my time as a modder. 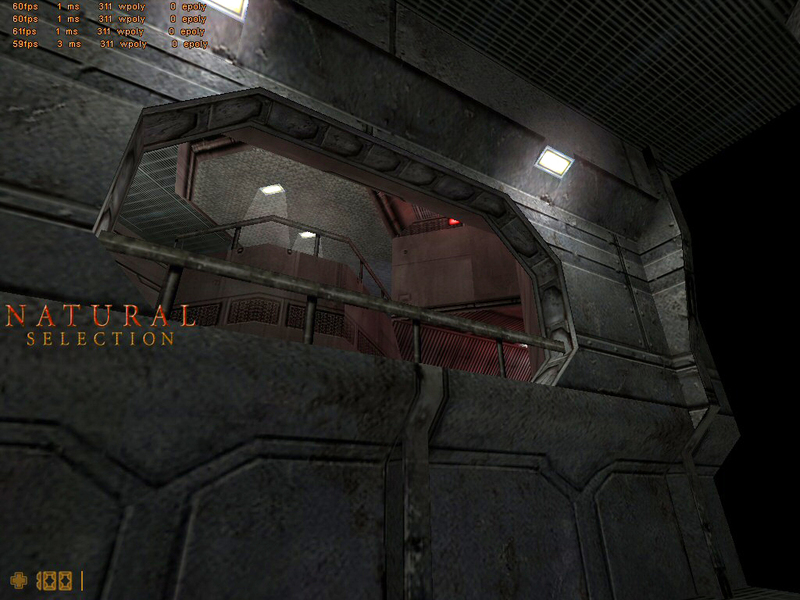 Lessons learned on Eclipse and Veil (the real one) continue to influence my work, development process, and career over the last ten years, as well as leave a mark on others (including, of course, the ns2_veil remake for Natural Selection 2 and an as-yet-unreleased ns2_eclipse still in the works by a NS2 community member). PS: briktal, I’m still sorry for the build where all the vents were too small. Hey man, long time no see! You are correct; I forgot to apply the gamma correction. It’s been a while. I’ll take another pass at those when I have time – thanks for reminding me! This was a great read. 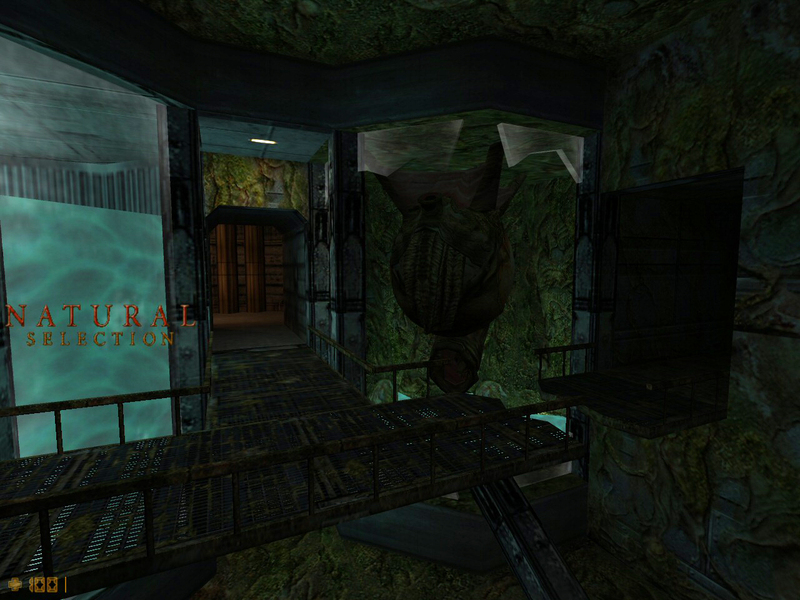 I remember looking at Eclipse and Veil a lot during my NS1 mapping days, though I never actually managed to produce a finished map back then. 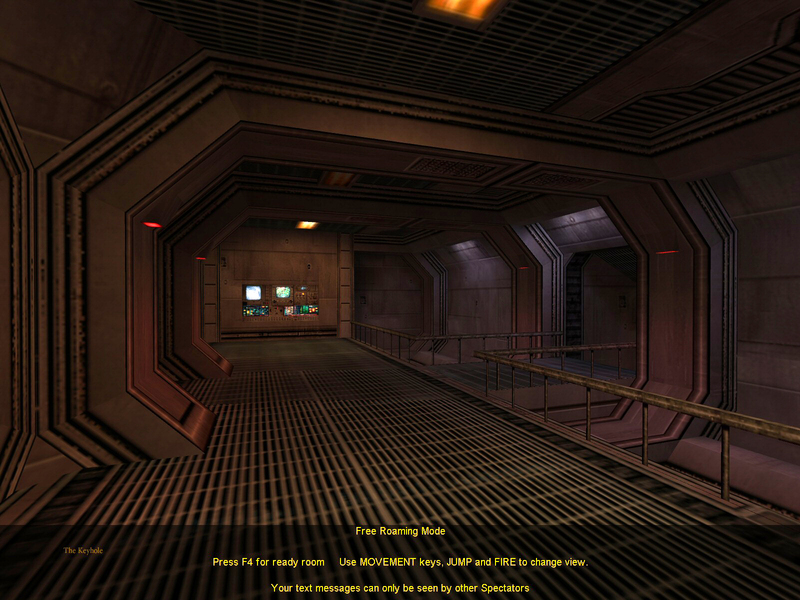 It’s also very interesting to see how you altered the layout while trying to figure out NS1 gameplay in those early days of the game before boxing out a map first became the standard. 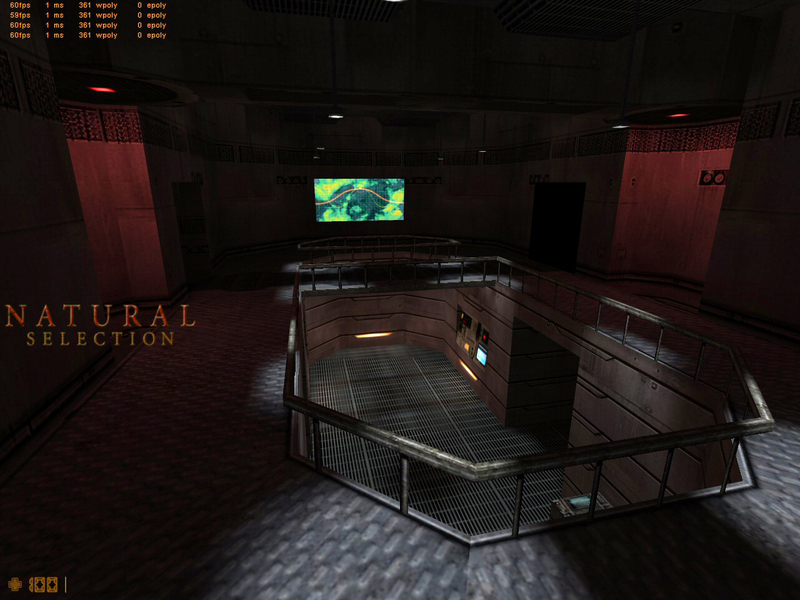 Additionally, amusing factoid: looking at the original Veil and FMPone’s remake of it is great inspiration for my remake of Caged, so these days I /still/ look at your maps for inspiration. 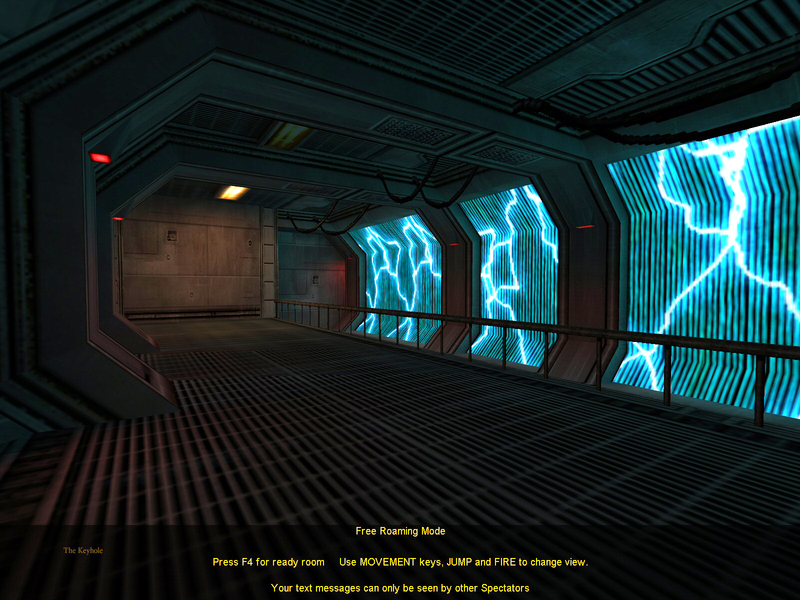 Nostalgia is right… I used to go by Flatline in the NS days and remember playtesting this. A friend of mine retweeted the article. Glad you’re at Bungie now! An enjoyable read : ) I was trying to make hammer work the other day and I got stuck! Back to it I think after reading this!